Sakurajima's Mystery Lights go CrAzY + a Lightening Surprise! Check out this light amazing light show that'll make you go hmmmmmm?!?!?!?! Re: Sakurajima's Mystery Lights go CrAzY + a Lightening Surprise! That's some light show in the top left screen, isn't it. As for the other thing seen shooting up from the volcano, I don't really get it. I've seen footage of this sort of thing before at the Japanese volcanoes and yet don't actually really go off. Just bits and pieces, like in this footage. Any idea what the aim of any UFO activity would be overall? Unfortunately I don't know enough about geophysics to even guess about the balls of light shooting out of the volcano...maybe plasma balls?!? AscendingStarseed wrote: Unfortunately I don't know enough about geophysics to even guess about the balls of light shooting out of the volcano...maybe plasma balls?!? I will keep looking, but found this. Not my kind of sport. flame and its ability to ‘tear’ the ground. Yep, I've done some more checking too and I think you might be right Higher Love. And, as for the UFOs flying past, we've got to remember these videos have been speeded up and that there's an airport nearby. In real time those 'UFOs' go as slow as planes. There's a road at the bottom of the volcano also, explaining the light moving across the bottom of the screen.......cars. And there are boats on the water, possibly with lights on. I've also considered that there may be security lights around the camera which may be flashing on with nearby movement. They would cause the large white flashes which are always just off camera.........or even someone taking photos nearby with a flash. All explainable really as natural and manmade phenomena. Of course, I might be wrong too. I'd rather not be right on this one, but here is a solid recreation. Kablooey. Oh - to keep this in context, I had not even watched the vids. I was just responding to the question. I do see your point about the second video, but I don't see any fireballs, either. It is obviously doctored up. Your theory that reflection is a likely culprit seems realistic to me. Whatever it is, it's not fireballs. The possible fireball is in the first video Higher Love. It shows a large 'something' shooting up out of the volcano at one stage, with a long white tail.......looking like a comet actually. Like you say, a large very hot rock being expelled with force, still 'steaming', or a fireball IMO. Sanicle wrote: The possible fireball is in the first video Higher Love. It shows a large 'something' shooting up out of the volcano at one stage, with a long white tail.......looking like a comet actually. Like you say, a large very hot rock being expelled with force, still 'steaming', or a fireball IMO. Weeee!!!!!!!! My psychic hit was good on this one then. Sanicle wrote: Yep, I've done some more checking too and I think you might be right Higher Love. And, as for the UFOs flying past, we've got to remember these videos have been speeded up and that there's an airport nearby. In real time those 'UFOs' go as slow as planes. There's a road at the bottom of the volcano also, explaining the light moving across the bottom of the screen.......cars. And there are boats on the water, possibly with lights on. I've also considered that there may be security lights around the camera which may be flashing on with nearby movement. They would cause the large white flashes which are always just off camera.........or even someone taking photos nearby with a flash. All explainable really as natural and manmade phenomena. Of course, I might be wrong too. As far as the cars go...I initially thought that too, but some of the lights at the bottom are doing some crazy things that cars don't do. Like stay in one place and get larger and larger and larger, or shoot lights out from them. Neither do boats...its too bad the picture isn't better defined, it leaves a lot for interpretation. Also the lights/orbs in the sky seem to be commonplace with many of the Japan volcano's...airplanes may explain some of them, but not the ones that shoot straight out of the volcano, other lights or stay stationery over the volcano for while before flying off or disappearing. Strange stuff...some of it is probably explainable due to traffic etc. It's the occurrences that aren't that are fascinating and really make you realize how much we don't know about our world. Wow great find Higherlove! 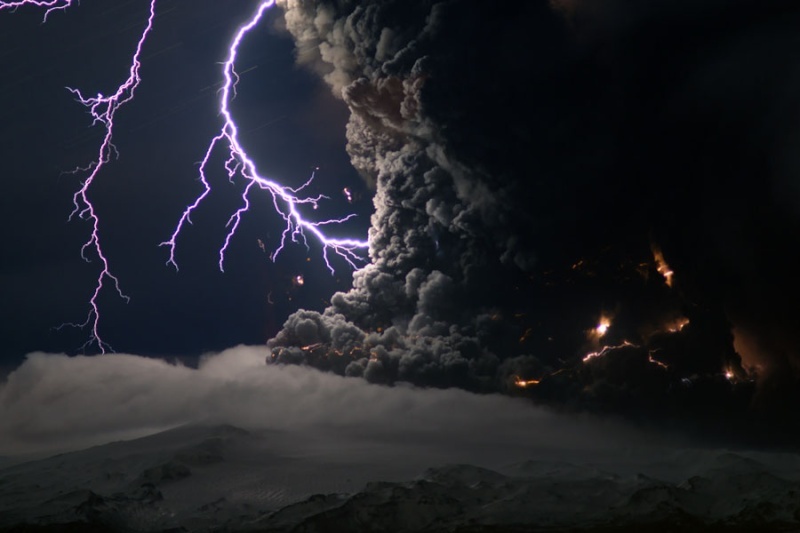 Seems like one of the volcano's in Indonesia was accompanied by an impressive Lightning storm too. Pretty amazing stuff...thanks!